Lindsey Ballard wasn’t superstitious. So she didn’t think twice about the old wives’ tale regarding bad luck for the bride and groom to see each other right before the wedding. She just needed to speak to her fiancé before she became Mrs. Beau William Greer, III, to have him put his arms around her. If she could rest her head against his chest and listen to the steady beat of his heart, hopefully that would still the nerves doing a line dance in her stomach. She bunched the fabric of her satin gown in her hands, tucking carefully through the halls of the gatehouse where they were preparing for her Lake Lanier Islands wedding, complete with an arbor at Legacy Pointe, overlooking the water. Careful to stay quiet so her bridesmaids wouldn’t overhear and stop her, she tiptoed, grateful for her ballet shoes. No heels. Beau William and she were the same height. She found that comforting after a lifetime of overblown personalities and a larger than life relative. The creak of an opening door had her glancing back quickly, ducking behind a rolling cart of china plates. Two staff members carried a massive floral arrangement of decadently expensive Black Magic roses, Black Baccara roses, peonies, and fuchsia orchids. Exhaling, she turned back – only to slam into a broad chest. A male chest. And he wasn’t dressed for a wedding or to work one either. She stared at his sports jacket over a concert t-shirt from some up-and-coming country band. And wasn’t that a musical reminder of her family and a world she’d left behind, the very last thing she wanted to think about today? So she focused on the moment and the impediment to her goal, looking up, up, and further up to a beard-stubbled square jaw on a handsome face. The bad boy kind of good-looking. The total opposite of her refined fiancé. A fiancé she desperately wanted to see, more than ever as those nerves kicked up the tempo on the dance in her stomach. She gathered up her dress and resumed her trek down the corridor. Steadying her breath, she reached for the brass door handle. She wasn’t superstitious. She needed that hug, the reassurance from her best friend in the world. This was the best thing she could do, wrap her arms around her good luck charm. Her rock. Her anchor in a crazy world. Except then she pushed through the door and found him. Her groom-to-be, Beau William Greer, III. In his dressing room at the exclusive Lake Lanier events venue. A dream location for a dream wedding to a dreamy man. A man currently holding hands with someone else. Holding hands. Gazing at each other. Sitting a hint too close to be anything other than intimate. And still she didn’t want to believe what her eyes told her. Not until Beau William turned to her with guilt and regret in his honey brown eyes. He shook his hand free of what had clearly been more than a platonic linking of fingers. And truth be told, there was something so much more intimate about that kind of touch than a kiss. A kiss was about passion, attraction. Holding hands was about affection, emotions. Love. Beau William – her best friend, her rock, her anchor – loved someone else. She wanted to scream. To run. To rage. None of which was possible because, oh God, there was a man standing behind her who may or may not have seen everything. Acting fast, she slammed the door in the stranger’s face and turned back to her fiancé and his … She couldn’t even bring herself to think the words that finished the betrayal. Lindsey swallowed back tears and rage and a crushing disappointment at the loss of her lifelong hope to finally be free of the bonds of her dysfunctional family that had disowned her and start a family of her own. She would talk to Beau William but she already knew. Her Lake Lanier Islands wedding, complete with the breathtaking Legacy Pointe arbor overlooking the water, was not going to happen. So much wasted money and time. Flowers. Wedding gown. Clothes. Travel. Plans spoiled sooner than the food that would go uneaten. She could smell the scent of the reception feast steaming from the silver chafing dishes. Everything expected of an up-and-coming mayoral candidate. Even if he was marrying a hair stylist. Her famous Nashville roots brought an added notoriety to their match that Beau William had joked would bring him extra votes. Or rather it would have. She’d done her best to keep the scandal of her grandmother’s secret under wraps. Not easy with some muck raking, wanna-be author trying to write a tell-all about her famous granny. Supposedly he was some record producer, probably looking to kick start his own flailing career. As if she didn’t have enough troubles when it came to her family. None of them spoke to her except to chew her out. They hadn’t even sent an RSVP for her wedding. Not that she expected her sister to come. But her mom? Lindsey had thought maybe her mother would at least show up for the social gravitas of the event. But nope, the phone had only rung for Lindsey to save their butts from scandal. And instead, she was about to bring scandal down on all of them. Because she couldn’t possibly marry a man who loved someone else. Lindsey waited for Beau William to deny the guy’s words, even though she already knew. Still … one glimmer of hope remained … and dimmed the longer he stayed silent, refusing to meet her eyes. Sorry for lying to her? For making her believe he loved her? God, she’d been such a gullible fool, seeing what she wanted to see. Lindsey squeezed her eyes closed and thrust her hands into her hair – three hours’ worth of an updo designed to look deliberately careless and windswept. Her hair was as important as her dress, given her career as a noted local stylist. Or rather her wedding hair had been important. Not anymore. Her fiancé had only bought her this princess engagement ring because of pressure from his father to have a wife on his arm. Bunching up fistfuls of her beaded pearl wedding dress in each hand, she spun on her heels and made fast tracks for the door. 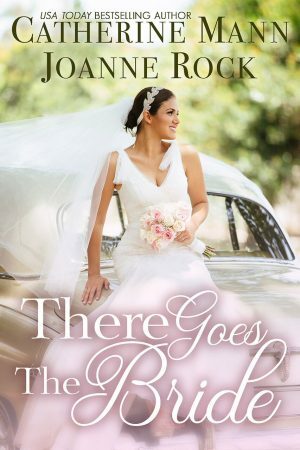 She needed to find her purse, then retrieve her suitcase from the bridal bungalow and get the hell out to … she didn’t know where right now other than wanting to be anywhere else but here. Did you know that There Goes the Bride and many titles are available digitally from Tule's own bookstore? Check it out!